One of my favorite sweetened matchas is made by Rishi Tea. It was long one of my indulgent purchases at Whole Foods. When I lived in Arlington, I preferred to go to the local cafe that served Rishi loose leaf tea. I've also come to know Rishi as the source for La Colombe's tea & tisane collection. And with the event I share below, I now know that they offer artisanal teas. Obviously, there are many dimensions to this 20-year old tea company. Jo was spot on in her assessment of the Rishi Tea tasting we attended in October. The tasting was an opportunity to "rediscover" the brand. 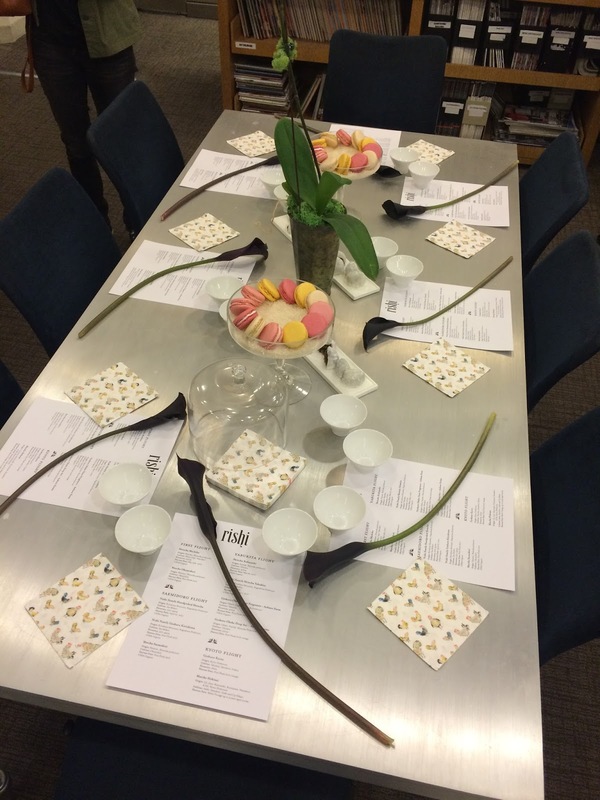 The tasting was held in the library of the International Culinary Center. I'm a huge fan of libraries so the space was immediately comforting. I looked around the room and recognized most of women there. The people at the table (the tasters) were all women. Our host was Keiko Niccolini, Director of Luxury and Brand Alignment, who prepared eleven teas across four flights. Macarons and mochi were the food accompaniments. In addition to preparing the teas, Keiko provided terroir, production, and tasting information about each tea. The teas in the flights share either origin or cultivar. The teas in the first flight share origin (Shimizu, Shizuoka Prefecture). 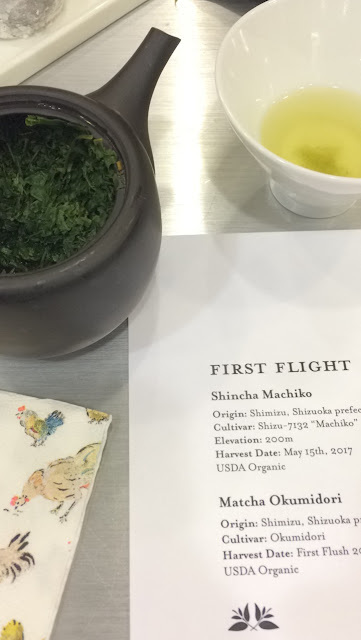 The teas in the second flight share cultivar (Sae Midori) though the cultivar listed for the matcha on the menu is Okumidori. The third flight shares cultivar (Yabukita). The fourth flight shares origin (Kyoto Prefecture). Read on for my notes on tea. The Shincha Machiko was sweet and vegetal. The Matcha Okumidori was thick, rich, and gritty. A memorably good matcha. I don't think I have had such a coarsely textured matcha before. The Matcha Saemidori was lighter than the Okumidori and creamy, too. I did not make notes on the Nishi Shincha. I could have been busy eating another macaron or mochi. The Nishi Gyokuro Kirishima was light bodied with a sweet-pea sweetness and a fruity tail note. As it cooled, the liquor was more vegetal in taste. 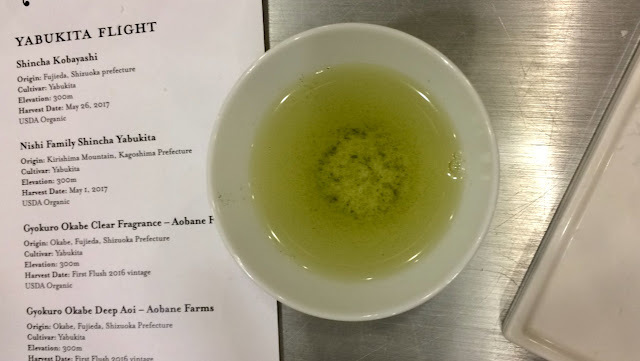 Keiko steeped this gyokuro for 45 seconds in 170F water. The Yabukita shinchas were strikingly different from each other. The dry leaves of the Shincha Kobayashi smelled of cream and custard with a sharp note of anise. The liquor was light-bodied, bright, sweet, and vegetal. There was a lingering note of tarragon. There was much discussion at my end of the table about the anise and tarragon flavors! The Nishi Shincha Yabukita was a sharper tea with walnut skin flavor. The Yabukita gyokuros also exhibited very different profiles. I wanted to eat sushi after drinking the Gyokuro Okabe Clear Fragrance from the Aobane Farm. This was an unfortunate state of affairs for me as I've committed to being a strict vegetarian. This desire was followed by my cheeks vibrating, puckering. I had an intensely dry mouth. On the other hand, the Gyokuro Okabe Deep Aoi was creamy! The liquor left a layer of cream on my tongue. The third sip showed a vegetal flavor. The empty cup smelled like hot sugar. The gyokuro in the fourth and final flight is Keiko's favorite gyokuro. 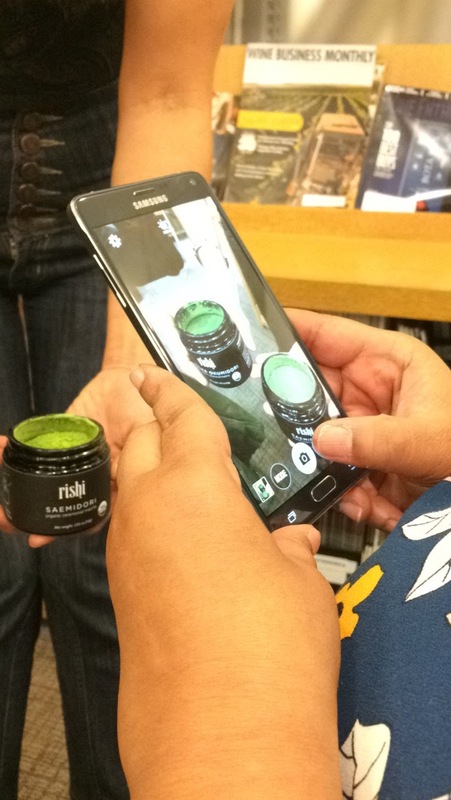 Her second favorite gyokuro is the Aobane Farm's Gyokuro Okabe Clear Fragrance. 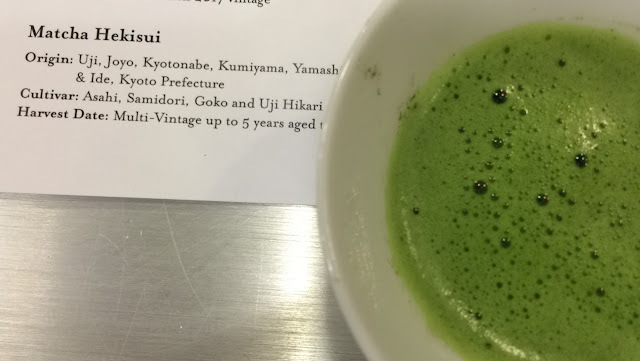 The Gyokuro Kyoto was smooth, balanced, sweet on top, and vegetal at the end. The Matcha Hekisui was according to my notes, "wow!" It was meaty and mushroom. It felt like I was drinking a meal. It would pair well with a meal of red meat and/or mushrooms. My favorites of the teas were the matchas, particularly the Matcha Okumidori, and the Yabukita gyokuros. None of my favorites were in my gift bag, but I have been enjoying the sweet pea, fruity, and slight umami flavors of the Nishi Family Gyokuro Kirishima. Did you know that Japanese green tea had such variety within the same style?